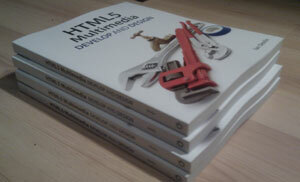 Welcome to the official site of the book HTML5 Multimedia, part of Peachpit's Develop and Design series. This site holds all the sample code that's mentioned throughout the book, as well as some extended examples. The code is easy to find, as it's listed under the relevant chapter below. You can purchase a hardcopy of the book online from various locations such as those listed below. EPUB versions are also available. Ian Devlin is an Irish web developer, blogger and author who enjoys coding and writing about emerging web technologies such as HTML5 and CSS3. As well as frontend development, Ian also builds things with backend technologies such as .NET and PHP. The code by chapter is listed below, click on [view] to expand the section to view the links to the relevant code. A chapter may also contain a link to further chapter information and errata. You can also download the code for each of the chapters for the examples. The downloaded code does not include the media files. To report typo errors, please send a note to errata@peachpit.com. For any content errors, or anything else, you can contact the author at info@html5multimedia.com.